Below are Box Office Collection report of Bollywood film The Ghazi Attack With his Budget and Total Box Office Income status. Also including of the film lead Star Cast is Rana Daggubati, Taapsee Pannu, Rahul Singh, Kay Kay Menon, Satyadev Kancharana. The Ghazi Attack is an Indian bilingual war film of 2017, directed by Sankalp Reddy & produced by Anvesh Reddy, Venkatramana Reddy, NM Pasha, Prasad V Potluri, Jagan Mohan Vancha. Storyline: The story is about an executive naval officer of the Indian Submarine INS Karanj and his team who remain underwater for 18 days. 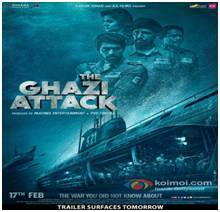 The movie explores the mysterious circumstances under which PNS Ghazi sank off the coast of Visakhapatnam in 1971. It is an underwater tale of the courage and patriotism of the men aboard the Indian Submarine S-21 who destroyed the Pakistani submarine PNS Ghazi when it ventured into Indian waters to the destroy INS Vikrant.